Bhopal : Journalism is essential for democracy. Journalism has given a new direction to the country’s politics. Had journalism not been there, the political scenario would have been entirely different in the country. Life of Makhanlal Chaturvedi even today, is a great source of inspiration for us. These views were expressed by Chief Minister Shri Shivraj Singh Chouhan while addressing the Makhanlal Chaturvedi Memorial lecture and Ganesh Shankar Vidyarthi Award ceremony organised by Makhanlal Chaturvedi National University of Journalism and Communication in Bhopal on Tuesday. 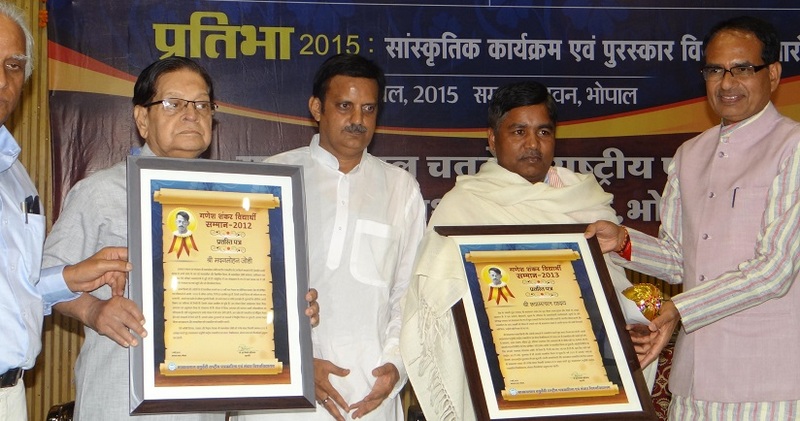 The Ganesh Shankar Vidyarthi award for the year 2012 was conferred upon senior journalist, Shri Madan Mohan Joshi while award for the year 2013 was conferred upon young journalist, Shri Shyamlal Yadav. On this occasion, Chief Minister said that Madan Mohan Joshi is not only a journalist but also a social worker. About Shyamlal Yadav, Chouhan said that he has reached a great height in the field of journalism at a very young age which is a great source of inspiration for the youths. He called upon the student to work hard and do not escape from working hard and should keep their goals big. He said that there is no bigger service than serving others and no bigger sin than harming others. Youths should practice journalism in such a way that they shine in the sky like stars. Giving four sutras of success to the students, he said that they should have ‘Paon Mein Chakkar’, ‘Muh Mein Shakkar’, ‘Sine Mein Aag’ and ‘Mathe Pe Barf’ and exhorted them to practice journalism which is in the interest of the society. Speaking on the occasion, Madan Mohan Joshi said that journalism should take resolution to be in a kind of journalism that is in the interest of individual, society and nation. Shyamlal Yadav, in his address, said that anything could be achieved in journalism by dint of hard work and the young generation should not refrain from hard work. VC of Himachal University, Prof. ADN Bajpayee said that the biggest challenge before the journalism today is to preserve the journalistic values. There is the need to encourage efforts which could help in preservation of values and sensitivity. The vice-chancellor of the university, Prof. Brij Kishore Kuthiala, on this occasion talked about the upcoming programmes of the university and expressed gratitude towards the guests. The entire programme was coordinated by head of the Mass Communication Department, Sanjay Dwivedi. The biggest characteristics of the human life is humanity. When there is lack of capability in humans, they will have mroe jealousy. Today people are not unhappy because of their own inefficiencies but because of efficiencies of others. To be able to get rid of their sufferings, people should become more capable. Today, there is need to emphasize on internal purification. We should focus on purity of body, mind, soul and conscience. Stregnths could be increased by creating knowledge. These views were expressed by the founder of Vedic Mission Trust, Swami Dharmbandhu. He said that the problems of the modern age were determined by the heads of different countries of the world in 2005 wherein they said that world should come out of wars and give stress on better management. Today, the biggest problem before the humab beings is the problem of character. Today, even those nations which are ruling the international platforms too seem to be admitting this fact that development is not possible without peace. He said that the renowned educationist of the country, BS Kothari advocated of an education system which could promote the spirity of humanity. Quoting the great philosopher, Russeau, he Dharmbandhu said that everything given to us by the nature is sacred but it is destroyed when it reaches the hands of the human beings. Knowledge should be taken and learnt even from the enemies. Giving knowledge is the biggest charity. Today the G-8 nations consititute 19 per cent of the total population of the world while they have 75 per cent of the world resources in under their possession. In his addres, Swami Dharmbandhu mentioned about 5 resolutions that students should take. First, studying the ancient literature, second: respecting our culture, third: feeling of affection towards the nation, fourth: try to establish ideals and fifth: raising voice against injustice and atrocities. He exhorted the student to live a hard working life and said that those not doing hard works in their lives do not have the right to pray to the almighty. Similarly, those who do not perspire should not have the right to relax. He said that a person is known by his thoughts and to be able role model for others it is important that one becomes patient, stay away from greed and should bring humility in one’s behaviour. Talking about the books authored by the great souls of the world, he appealed the students to go through them. Prize distribution for cultural and sports event Pratibha-2015 : The prize distribution ceremony for annual cultural and sports fest Pratibha-2015 was also organised during the function. Students also presented cultural activities like skit titled, ‘Paagalon Ki Duniya’ to highlight the corruptions and irregularities prevailing in the society. The folk dance, Kalbeliya, presented by the students also enthralled the audience. The Universiy Band too mesmerised the audience with their musical instruments. During this, the winners of different competitions like essay, feature writing, debate, extempore, animation, cartoon, poster, powerpoint presentation, play, dance, quiz and others were also given away felicitated with prizes. Vice-Chancellor of the university, Prof. Brij Kishore Kuthiala, VC of Himachal University, Prof. ADN Bajpayee, senior journalist Radheshyam Sharma and senior litterteur, Kailashchandra Pant were present to give away the prizes to the winners of the competitions. 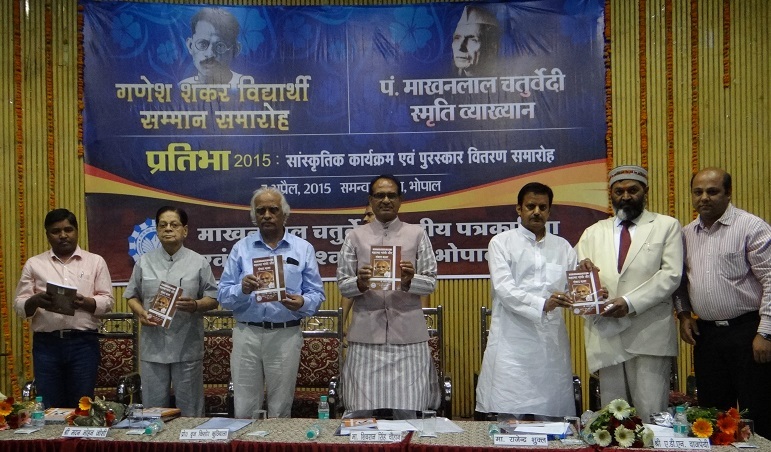 During the function, two books published by the Publication Department of the University were released by Chief Minister Shivraj Singh Chouhan and other dignitaries present on the dais. The book authored by Saket Dubey, ‘Dharmvir Bharti: Patrakarita Ke Siddhant’ and ‘Mahatma Gandhi Aur Samvad Kala’ written by Manoj Chaturvedi were released on the occasion.